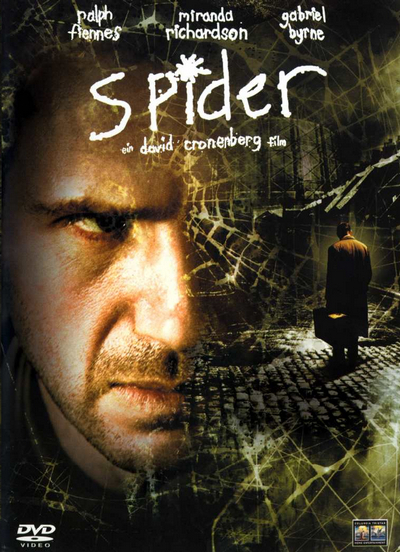 Spider is Dennis Cleg, a man whom we learn is being reintegrated into society after many years in a hospital for the mentally unwell. Arriving at a halfway house, he is soon surrounded by the noises and confusion of others of his kind and even makes some acquaintances. However, all is not well with Spider and in the ongoing days his memories of growing up in the same neighbourhood as the halfway house come back more and more heavily. We see Clegg revisit his past as an onlooker, standing in the background as he watches his younger self and his parents, played by Gabriel Byrne and Miranda Richardson, go through the horrifying events that led to the fracture of his psyche. The long-suffering mother bonds with her only son, whom she nicknames Spider, while the angry alcoholic father cheats on her with a vulgar whore he picks up in a pub. Soon it is apparent that not all of Spider’s memories are true, nor are they clear and precise and finally we learn of the awful reason why Spider was in a mental institution in the first place.